Distinctive machined Handlebar Risers with added ergonomics that help eliminate hand numbness. 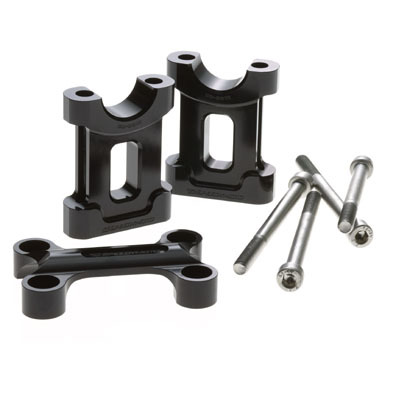 Machined out of strong billet aluminum the SpeedyMoto riser kit adds 20mm (~ 3/4) of rise to your stock handlebar. This added height changes your riding stance to a far more comfortable position that reduces the weight on you wrists. Increasing the rise of your handlebars will give you a commanding grip of the bars that will allow you to ride longer with less rider fatigue. Detailed attention was given to make our Handlebar riser kit attractive and smart looking to match your own personal style and taste.